I have a special treat for you all this week! Not only is it a new recipe from my upcoming release, Shadow Of Sin (Erin and CJ’s story, for those of you who have been waiting :)), it’s specially formatted into a recipe card so you can download it and print it out! They say the way to a man’s heart is through his stomach. In the case of Erin Flannery and CJ Kovacs, the adage is only partially true. Though a teenage Erin first caught young CJ’s attention with the delicious Peanut Butter Blossom cookies she was selling, it was her big gray eyes and shy smile that kept him coming back for more. Bake up a batch of these cookies today. Who knows who you’ll attract? Beat shortening and peanut butter in a large bowl until well blended. Add 1/3 cup granulated sugar and brown sugar, beat until fluffy. Add egg, milk, and vanilla, beat well. Stir together flour, baking soda, salt, cinnamon and nutmeg. Gradually beat into peanut butter mixture. Shape dough into 1 inch balls. Roll in granulated sugar and place on an uncreased cookie sheet. Bake 8-10 minutes until lightly browned. 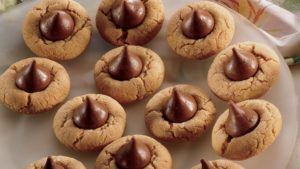 Immediately press a Kiss into the center of each cookie. the cookie will crack around the edges. Remove cookies from the cookie sheet and place on a wire rack to cool.